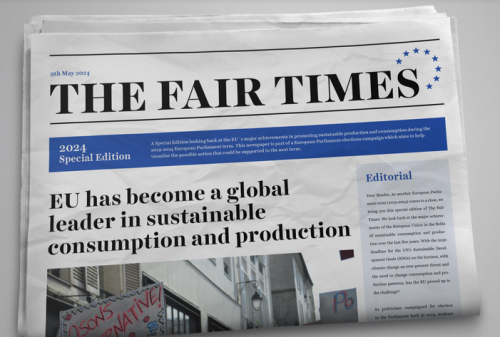 ECOLISE and four other European and International civil society networks have jointly published a fictitious newspaper – The Fair Times – with stories of what could be achieved if transformative policies for a fair and sustainable Europe are adopted and implemented. With a publication date of 9th May 2024, the end of the next term of the European Parliament, articles discuss tackling imbalances of power in supply chains, promoting social solidarity enterprises and the need for urgent action against resource depletion and the decline in biodiversity. Other topics covered range from organic farming to ethical financing, community-led initiatives to sustainable public procurement. The newspaper marks the launch of a joint campaign calling on the next Members of the European Parliament to make Europe sustainable and fair by 2024. “We wanted to initiate a campaign that brought a community of like-minded networks together to call with a unified voice for a transformative EU sustainable consumption and production agenda which serves both people and planet,” said Sergi Corbalán, Executive Director of the Fair Trade Advocacy Office (FTAO), one of the networks involved. FTAO leads the global Fair Trade movement’s advocacy at EU level. The other organisations involved are: IFOAM EU (European umbrella organisation for organic food and farming), CIDSE (International family of Catholic social justice organisations) and RIPESS-Europe (the European network for the Promotion of Social Solidarity Economy). “The European Parliament elections are a decisive moment in which citizens and civil society can make their voices heard by voting and putting forward important issues, such as sustainable consumption and production. Through promoting good practices that are ongoing in communities across Europe and calling for an enabling policy environment at EU level, we hope this campaign will motivate candidates to understand the impact of our current production and consumption patterns and how, if elected, they could make a huge difference in the EU decision-making process,” added Corbalán. For more information, contact Ffion Storer Jones, Communications Assistant at the FTAO at gro.y1555619901cacov1555619901da-ed1555619901artri1555619901af@sl1555619901essur1555619901b1555619901 or +32 (0) 2 543 19 23.